Recently NABARD has issue notification regarding postpone assistant manager examination 2018. Applications are invited from Indian citizens for the post of Assistant Manager in Grade ‘A’ in the Rural Development Banking Service (RDBS) in National Bank for Agriculture and Rural Development (NABARD). 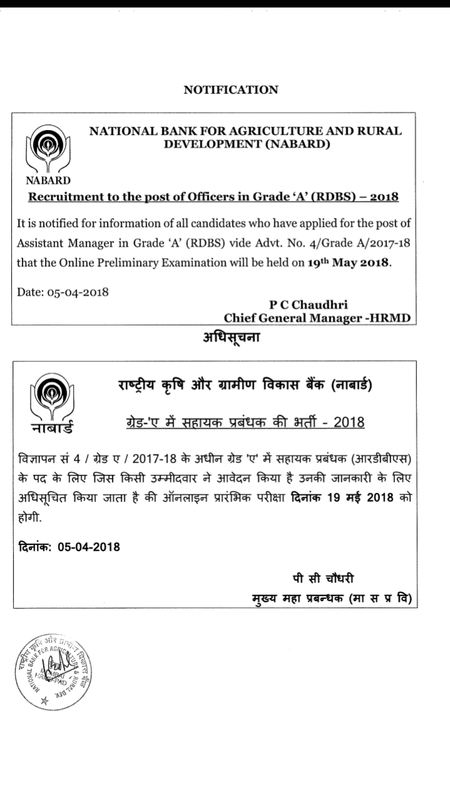 Candidates can apply only ON-LINE on NABARD website for NABARD ASSISTANT MANAGER RECRUITMENT 2018 IN RDBS. www.nabard.org/Career Notices between 13 March 2018 and 02 April 2018. 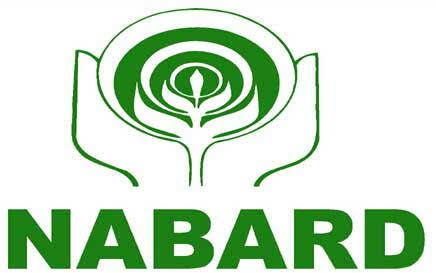 NABARD ADMIT CARD: on 27 april onward for prelim exam. NABARD PHASE-I PRELIM EXAM: 12th may 2018. 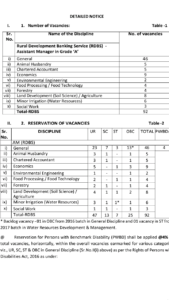 NABARD issue notification of total 92 vacancy in varios discipline like , genral , finance , agriculture, water Irrigation, social , Environment, forestry , etc. For deatail reservation wise vacancy below. (As on 01 March 2018) – The candidate must possess the required educational qualification as on 01 March 2018. The result of final term / semester/year examination of the required educational qualification must have been declared on or before 01 March 2018. In other words, candidates whose final year/semester results have been declared on or after 02 March 2018 are not eligible to apply. Bachelor’s Degree in a particular discipline means that the candidate must have studied that discipline as main subject in all the semesters / years of respective degree course and it must be mentioned in the Degree Certificate issued by the University/Institute. 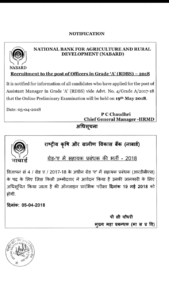 NABARD ASSISTANT MANAGER RECRUITMENT 2018 IN RDBS qualification needed as below. i. General: Bachelor’s Degree in any subject with a minimum of 50% marks (SC/ST/PWBD applicants 45%) in aggregate or Post Graduate degree with a minimum of 50% marks in aggregate (SC/ST/PWBD applicants 45%) from a recognized University or Ph.D OR Chartered Accountant /Cost Accountant / Company Secretary with Bachelor’s degree OR Two years full time P.G. Diploma in Management / full time MBA degree from Institutions/Universities recognized by GOI. / UGC with Bachelor’s Degree in any discipline. ii.Animal Husbandry: Bachelor’s Degree in Veterinary Sciences/Animal Husbandry with a minimum of 50% marks (SC applicants 45%) in aggregate or Post Graduate degree in Veterinary Sciences / Animal Husbandry with a minimum of 50% marks (SC applicants 45%) in aggregate from any recognized University / Institute. iii. Chartered Accountant: Bachelor’s degree in any discipline from a recognized University/Institution with Membership of Institute of Chartered Accountants of India (ICAI). The Membership of ICAI must have been obtained on or before 01 March 2018. iv.Economics: Bachelor’s Degree with Economics/Agriculture Economics with 50% marks (ST applicants -45%) in aggregate or Post Graduate degree in Economics /Agriculture Economics with a minimum of 50% marks (ST applicants-45%) in aggregate from a recognized University/Institution. Candidates with Economics as one of the main subjects at all years/semesters of the course, will only be eligible. v.Environmental Engineering: Bachelor’s degree in Environmental Science / Environmental Engineering / Climate Change / Climate Change Adaptation with 50% marks in aggregate or Post graduate degree in Environmental Science / Environmental Engineering / Climate Change / Climate Change Adaptation with 50% marks in aggregate, from a recognized University/Institution. vi.Food Processing/Food Technology: Bachelor’s degree in Food Processing /Food Technology with 50% marks (ST applicants 45%) in aggregate or Post Graduate degree in Food Processing /Food Technology with 50% marks (ST applicants 45%) in aggregate from a recognized University/Institution. vii.Forestry: Bachelor’s degree in Forestry with 50% marks (SC applicants 45%) in aggregate or Post Graduate degree in Forestry with 50% marks (SC applicants 45%) in aggregate from a recognized University/Institution. Land Development (Soil Science) / viii.Agriculture: Bachelor’s Degree in Agriculture / Agriculture (Soil Science/Agronomy) with 50% marks (SC/ST applicants – 45%) in aggregate or Post Graduate degree in Agriculture / Agriculture (Soil Science/Agronomy) with a minimum of 50% marks (SC/ST applicants 45%) in aggregate from a recognised University / Institution. ix.Minor Irrigation (Water Resources) Bachelor’s degree in Hydrology/Applied Hydrology or Geology/Applied Geology with Hydrogeology /Irrigation /Water Supply & sanitation as one of the subjects with 50% marks (SC/ST applicants 45%) in aggregate or Post Graduate degree in Hydrology/Applied Hydrology or Geology/Applied Geology with Hydrogeology /Irrigation /Water Supply & sanitation as one of the subjects with 50% marks in aggregate (SC/ST applicants 45%) from a recognized University. x. Social Work: Bachelor’s degree in Social Work with 50% marks (SC applicants 45%) in aggregate or Post Graduate degree in Social Work with 50% marks (SC applicants 45%) in aggregate from a recognized University. 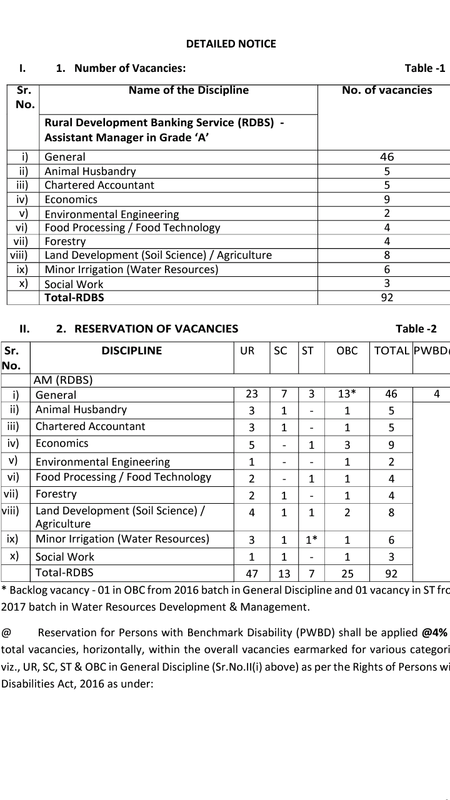 RAJASTHAN RSSMB COMPUTER VACANCY RECRUITMENT 2018. Canara po recent question paper 2018. What will be the syllabus for NABARD Grade A post? Recommend some good books for the preparation. Syllabus would be same as ibps exam syllabus.